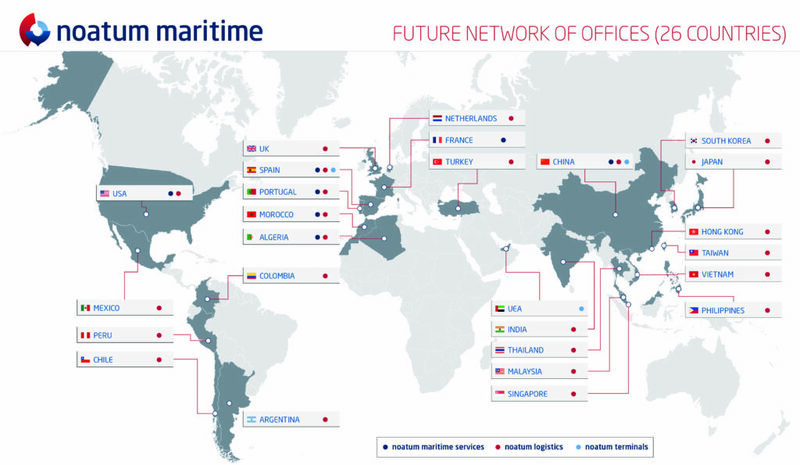 Madrid, 21 March 2019 – Noatum Logistics, the Noatum Maritime division specialising in logistics, international transport and customs, has signed a definitive agreement to acquire MIQ Logistics, which is based in the USA and has 60 plus offices in 19 countries. The agreement is expected to close in the coming weeks. Once the agreement has been concluded, Noatum Logistics will have made a strategic leap as one of the world’s leading companies in its field, contributing greater added value to the logistics chain of all clients. With a consolidated turnover of more than 600 million USD, it will be present in 24 countries, combining operational and commercial synergies. Noatum Logistics has posted significant increases in its activity in recent years. With this acquisition, it will become a leading global logistics provider. In addition to almost tripling its current presence by incorporating markets that are crucial for complementing its global range of services, adding strategic countries including Japan, South Korea, Taiwan, China, Hong Kong, India, Vietnam, Thailand, Singapore, the Philippines and Malaysia in Asia; the United Kingdom and the Netherlands in Europe; Mexico, Argentina, Colombia, and Peru in Latin America and the United States. In addition to these countries, Noatum Logistics has offices in Chile, Turkey, Portugal, Algeria, Morocco and Spain. With the same strategic business vision, in-depth knowledge and specialization of its professionals, Noatum Logistics will expand its multicultural character and innovative spirit by offering specific and valuable services for clients’ supply chain in different industrial sectors. Meanwhile, Noatum Logistics will keep its current network of agent partners, and continue to work to strengthen its relationships. Both workforces of MIQ Logistics and Noatum Logistics will be integrated, as there is no geographical overlap except in Chile, where the services complement each other. The consolidation of Noatum Logistics and MIQ Logistics will increase the geographical presence and will also significantly boost synergies with the Group’s other two divisions: Noatum Maritime Services and Noatum Terminals. The operation, which is part of its Strategic Plan, makes Noatum Maritime, which is based in Spain, one of the leading groups in its sector on an international scale, with more than 2,400 employees and a direct presence in 26 countries. MIQ Logistics, which is based in Overland Park, Kansas (USA), was established in 2000 and was acquired by Austin Ventures from YRC Worldwide in 2010. MIQ Logistics currently has a direct presence with 15 locations in the United States; 11 countries and 26 locations in Asia; 13 locations in Latin America and 8 in Europe. It has recently received awards from Global Trade, Inbound Logistics and Retail Week Supply Chain. Noatum Maritime is a leading company in maritime, logistics and port services, and is structured in three business units: Noatum Maritime Services, Noatum Terminals and Noatum Logistics. The Group has offices in North and South America, Europe, North Africa, the Arabic Gulf and Asia. Noatum Maritime Services covers a wide range of services, ranging from shipping agency to commercial representation, including specialised transport solutions. It also provides auxiliary services related to land transport, storage and distribution. Noatum Logistics operates as an integrated logistics operator through its own companies and a wide network of agents. Noatum Terminals is one of the leading port operators in Spain. With specialised terminals for bulk, general cargo and vehicles, it is present in fifteen Spanish ports and in the Khalifa Port (United Arab Emirates). The only official versions related to this information are those issued exclusively by Noatum Maritime in English and Spanish. Translations in other languages are not attributable to the company, and may contain unreliable details or information as a result.